Home Run. 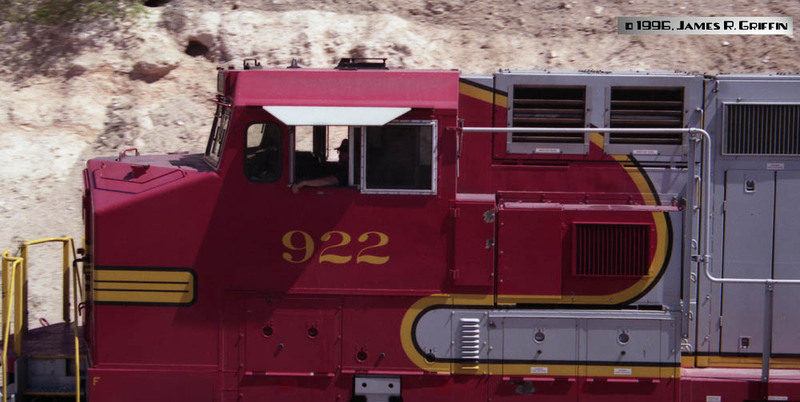 That’s the only way to describe the revived red-and-silver Warbonnet paint scheme, seen here close up on the cab of C40-8W No. 922. The original designers hit this one right out of the park, and it really worked on the modern GE locomotives. 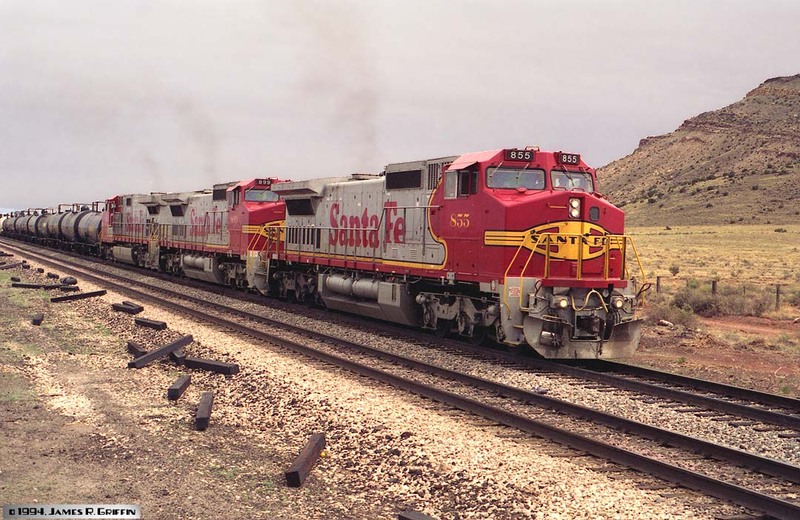 Santa Fe’s “Warbonnet” paint scheme is one of the all-time classics in American railroading. Passing through several variations since its introduction in 1937, the design is instantly recognizable. 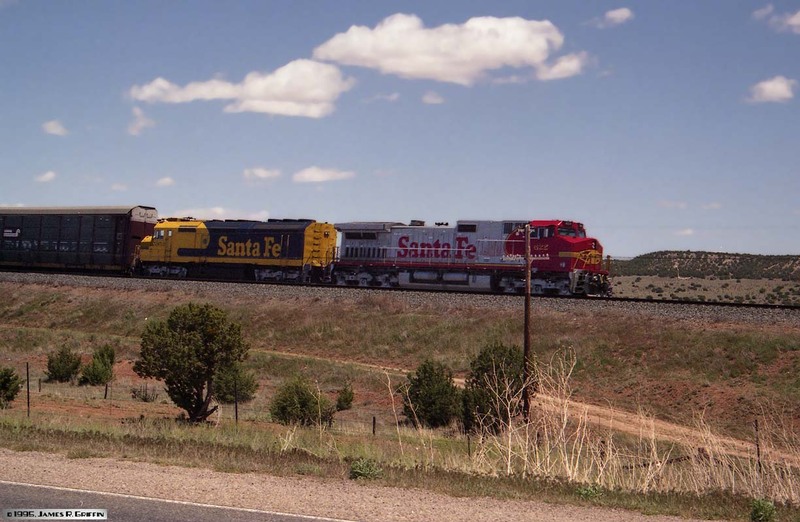 A Warbonnet-clad locomotive says “Santa Fe” louder than anything else. On several occasions between May 1994 and October 1997, I had occasion to be in Mountainair, New Mexico, and nearby locales. 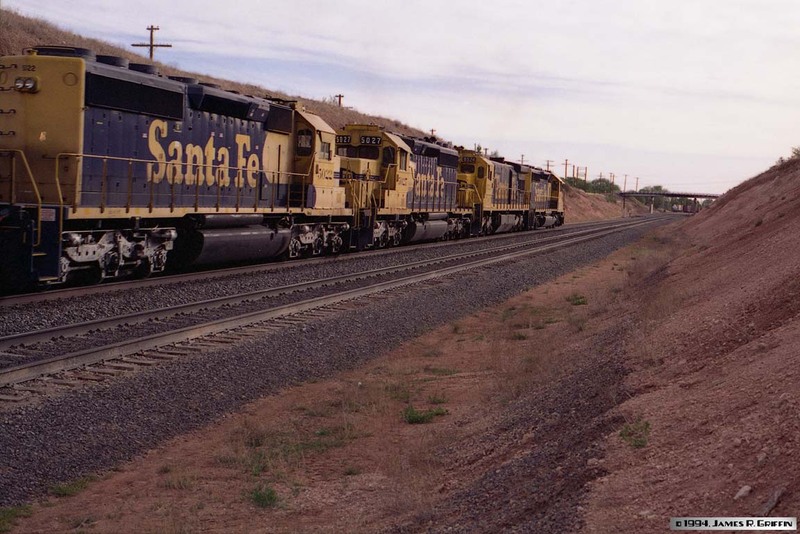 Mountainair is a hamlet adjacent to the summit of Santa Fe’s main line between Amarillo and Belen. The rails follow Abo Canyon up from the Rio Grande valley, which is a pretty steep climb to Abo Summit. To the east the ground is high and the grades more moderate. 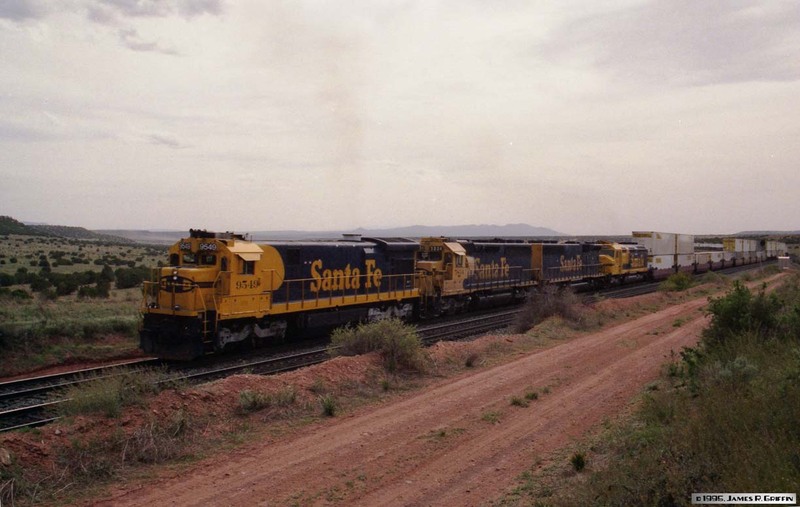 It was fortuitous that I took these images, since they offer a glimpse of the last days of the Santa Fe before the BNSF merger. 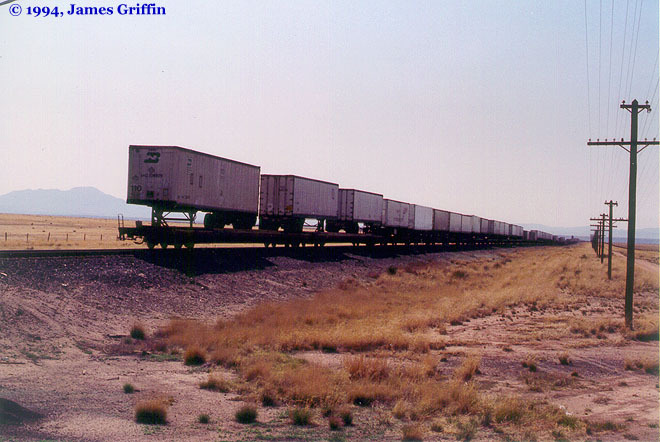 On May 13, 1995, a westbound autorack is a couple miles past the summit. Notice the interesting mix of power: Dash 9-44CW (alternately, a C44-9W) and F45. 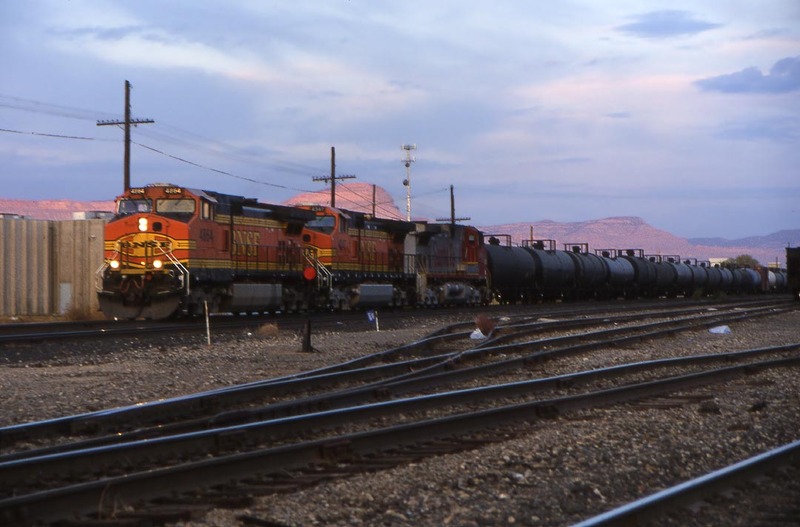 Fun to see two versions of the Warbonnet running together like this. 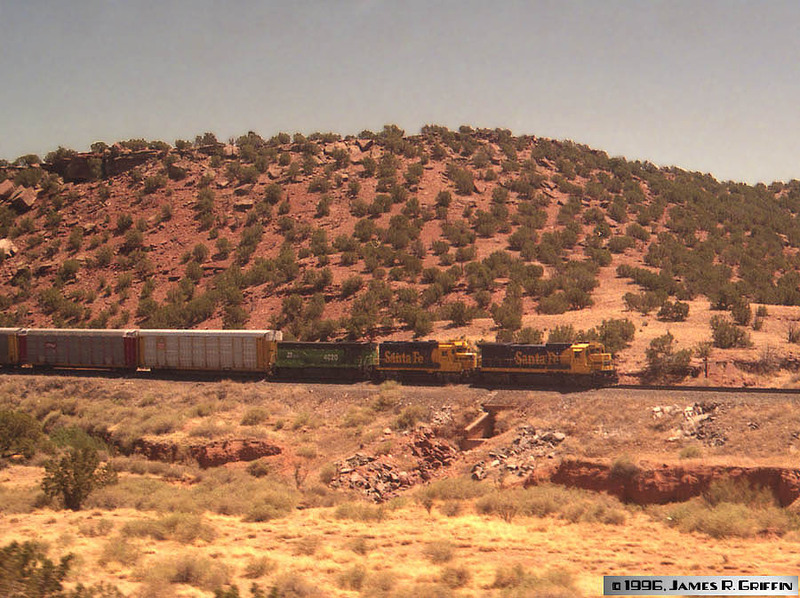 The J.B. Hunt company had a close relationship with the Santa Fe, and shipped hundreds of trailers and containers daily. 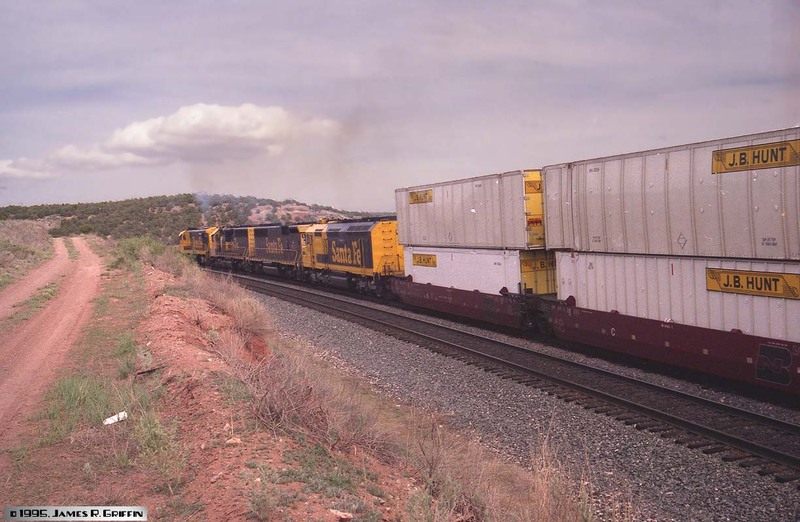 BOTTOM: Same train, going away, showing the styles of containers in use (soft-sided 48-footers on top, rigid 45’s on the bottom). Also note that the well cars are BN– a foreshadowing of the imminent merger. Sandy clay, scrub grass and tumbleweeds, hot sun and chilly winds carrying dust are constant companions in New Mexico. It’s a harsh environment, yet the Santa Fe ran an absolutely first-class operation there. Now BNSF continues the tradition. 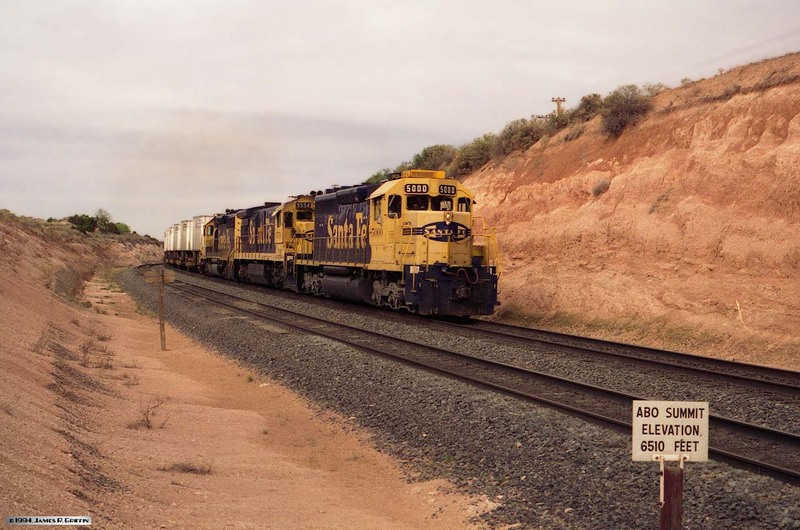 One morning late in March 1988, I photographed this westbound train just west of Holbrook, Arizona. Half of its six units were still wearing the paint scheme from the recently-thwarted SPSF merger. Leading is SD45u No. 5375, followed by SD40-2 No. 5044, GP50 No. 3811, SD45u No. 5348, F45u No. 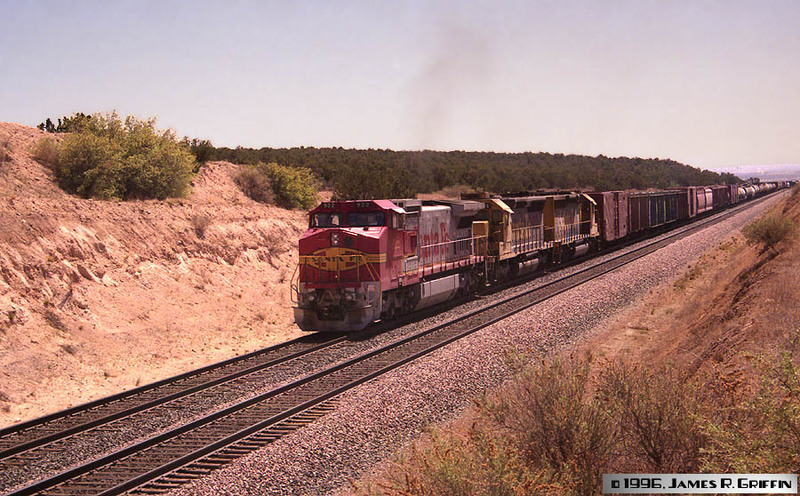 5950, and another SD45u. This was a bunch of horsepower for a fairly short manifest freight train. 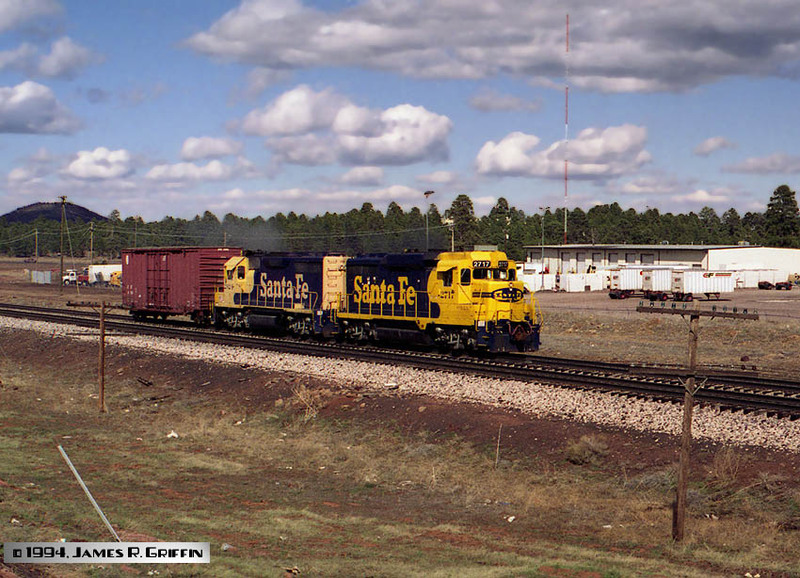 April 1994, I photographed this local switching movement in Flagstaff, AZ. GP30u No. 2717 is leading at the moment. 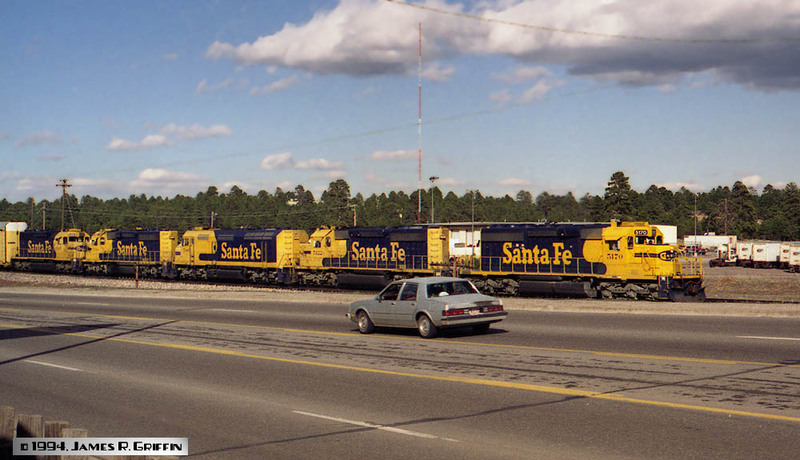 A westbound autorack train with a typical selection of Santa Fe power moves through Flagstaff, on the same day as the train above. SD40-2 No. 5170 is on the point, with snoot SD40-2 No. 5122 next, plus three more units in blue-and-yellow. 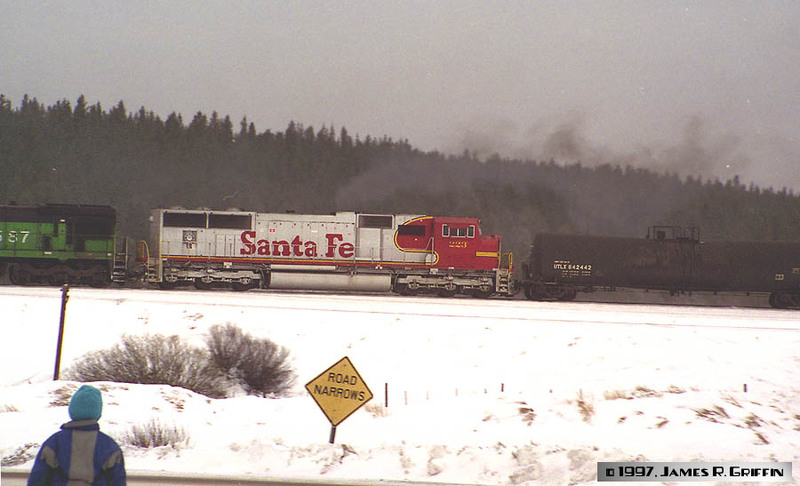 On 12/28/1997, an eastbound trackage rights BNSF train is hitting the 2% grade at Fraser, CO with SD75M No. 223 as the trailing unit. 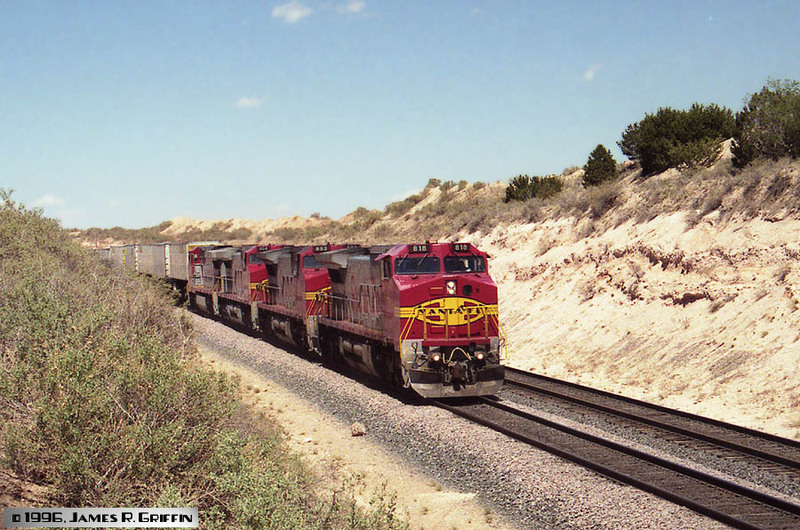 Not long after the merger (February 1996), SD40-2 No. 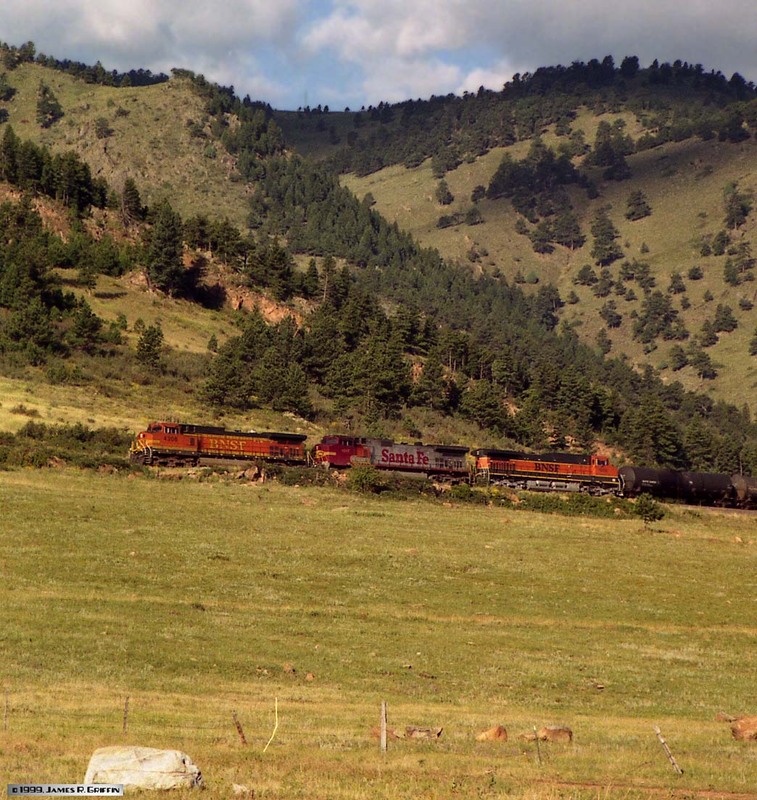 5044 is leading a short northbound manifest at Fountain, Colorado, on the joint line. 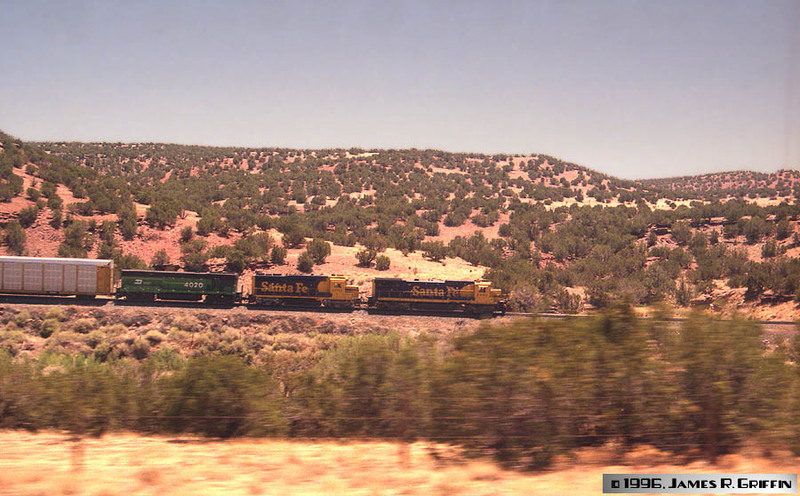 In 1999, a Santa Fe Dash-9 is in the middle of a BNSF trackage rights train exiting Coal Creek Canyon on the former D&RGW route. 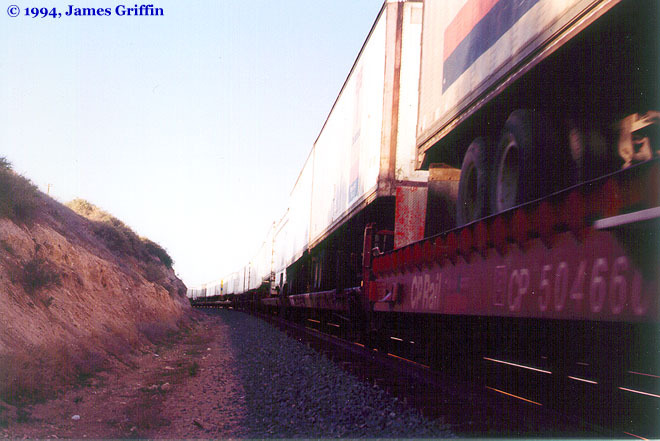 A westbound BNSF freight pauses at Grand Junction to change crews on the evening of November 11, 2001. An unpatched Santa Fe C44-9W is running third on this train. The periods just after mergers are usually hard on railfans, especially if they have a strong attachment to the previous roads. Looking back, however, these times show to be extremely interesting, with a wide variety of equipment mixed together, and running in locales where it was never seen before. Such was the case in May 1996 when I made yet another trip to the Abo Summit area. 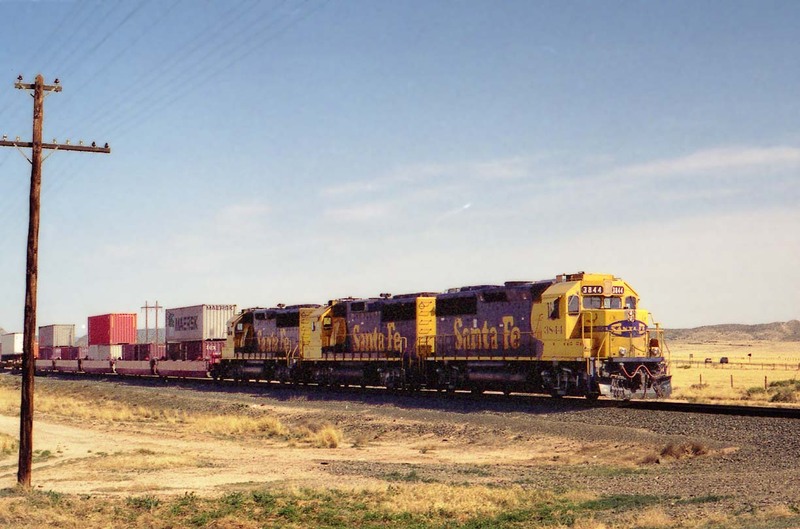 BN equipment was becoming common, but solid sets of AT&SF power were still a regular occurrence. 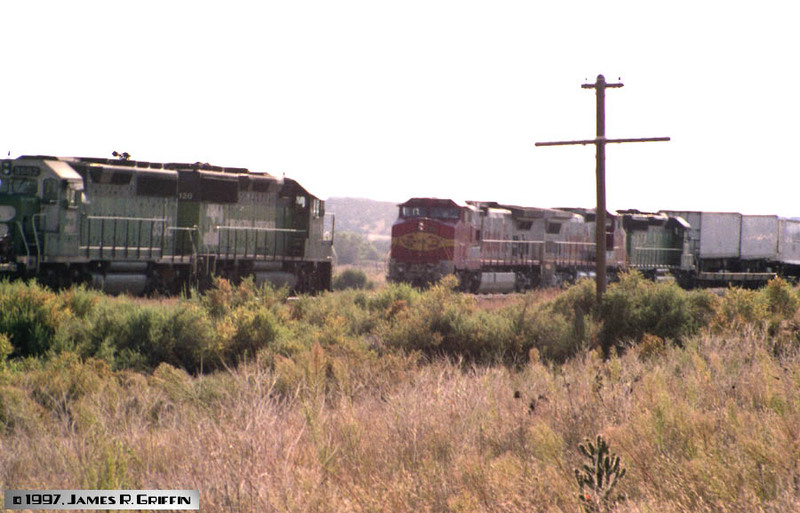 Pure Santa Fe: Three Dash-8’s (818, 893, 804) and a C44-9W fly past with a westbound intermodal train at Abo Summit. 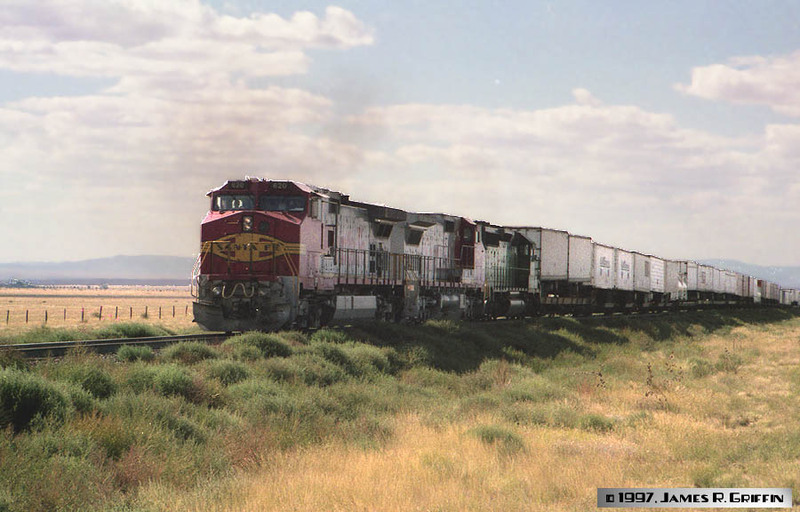 Next morning, this eastbound pig train had ATSF SD40-2 No. 5181 on the point, followed by three BN alumni. No doubt now about it being in the post-merger era. 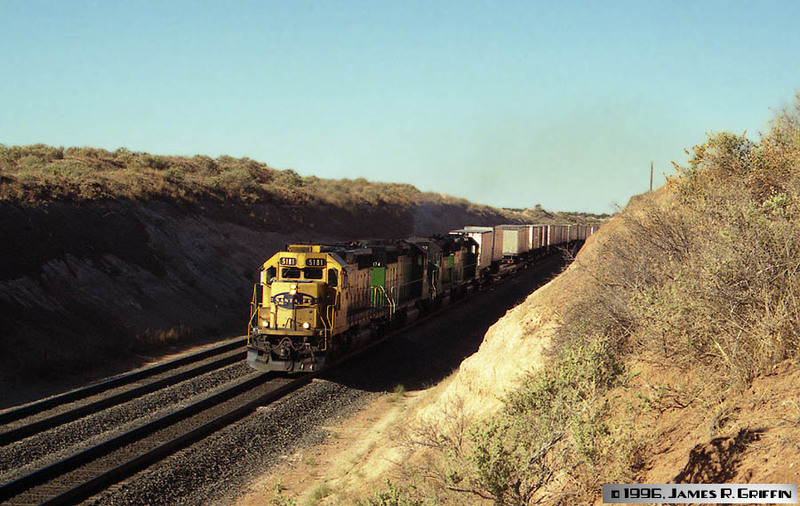 West of the summit, this autorack train had quite a variety of power, with B40-8 No. 7442, GP30u No. 2784, and BN B30-7A No. 4020. Too bad the photo was backlit. Another look at the same train, approaching Scholle. 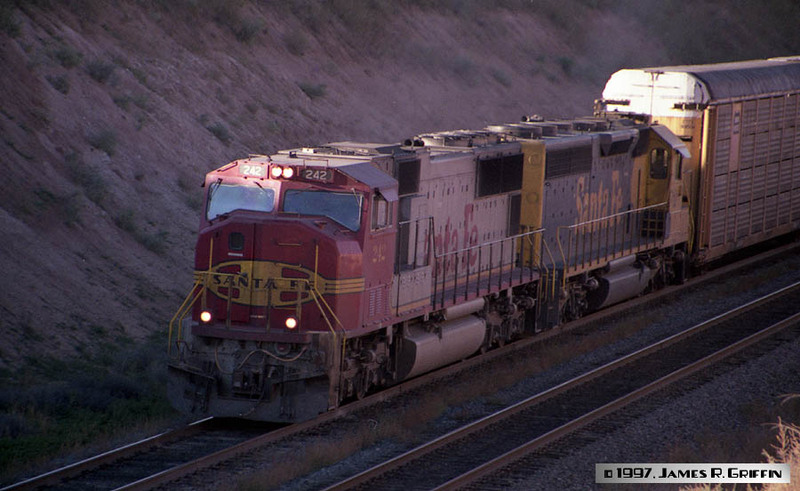 After the merger, BNSF experimented with a variety of paint schemes. 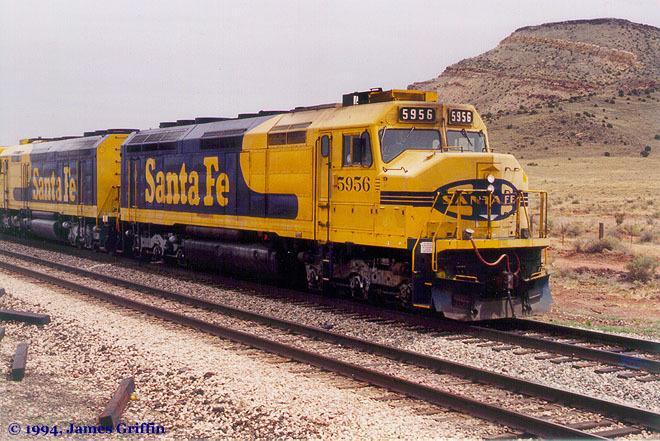 One was based on traditional AT&SF colors (essentially the red-silver warbonnet with BNSF letters); another drew heavily on the Great Northern colors of the past (Heritage I, or H1); yet another blended the Santa Fe blue-yellow with the GN scheme (H2). 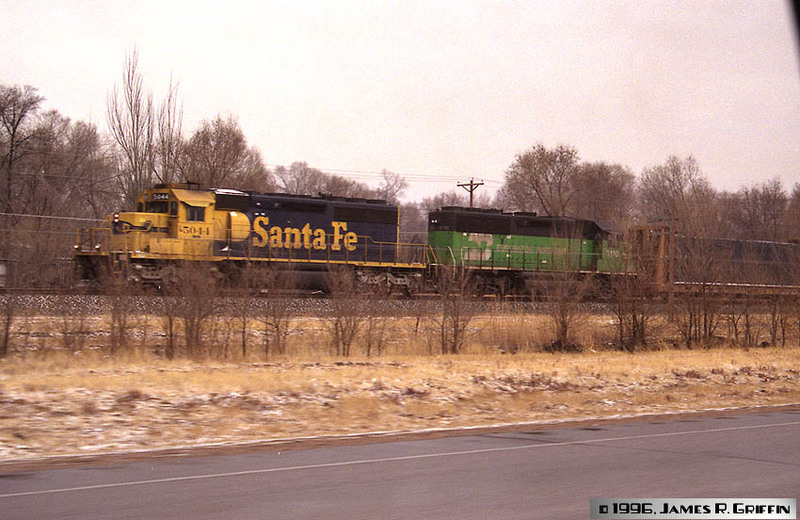 Mix these with the two Santa Fe schemes still running and the various BN green schemes, and you had a rainbow of locomotive paint. This continues to the present, though the BNSF orange has come to dominate. A couple of days near Mountainair, October 10-11, 1997, revealed just what a variety could be seen on any given day. Early afternoon on October 10th, this eastbound pig train approaches the grade crossing at Sais. It has C44-9W No. 620 and on the point, with C40-8W No. 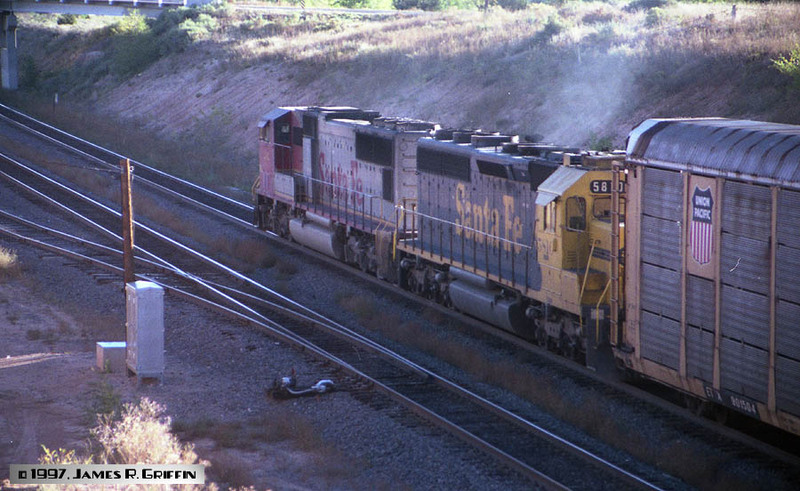 809 and BN SD40-2 No. 7115 assisting. 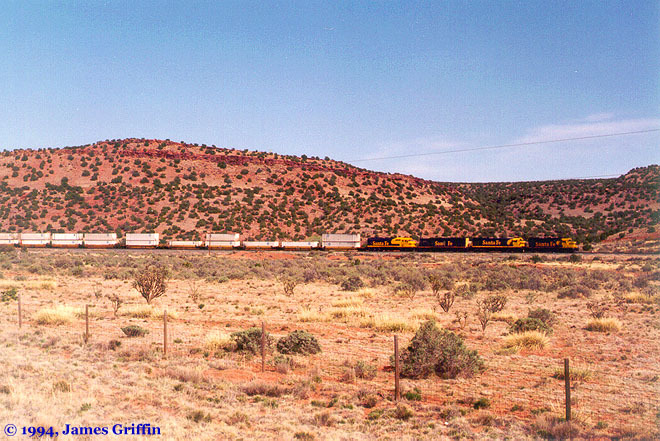 A few miles east, at Abo, the same train meets a westbound baretable with a pair of BN geeps for power. Early on October 11, this eastbound rack train passes through the cut at Mountainair at Abo Summit, led by SD75M No. 242 and SD45-2u No. 5810. Neither has been “patched” yet with BNSF lettering. The same train, going away. How these two shadowy photos turned out so well is beyond me! I really like the SD45-2s. 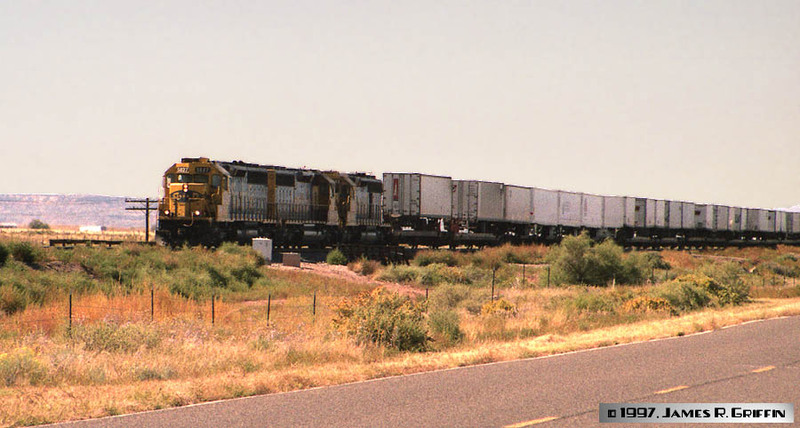 This one was repainted in BNSF H1 paint the following year. Following right behind was this pig train with a solid set of AT&SF SD45-2s– all in blue-and-yellow, no less. This was getting less common, and would be very rare within a couple of years. 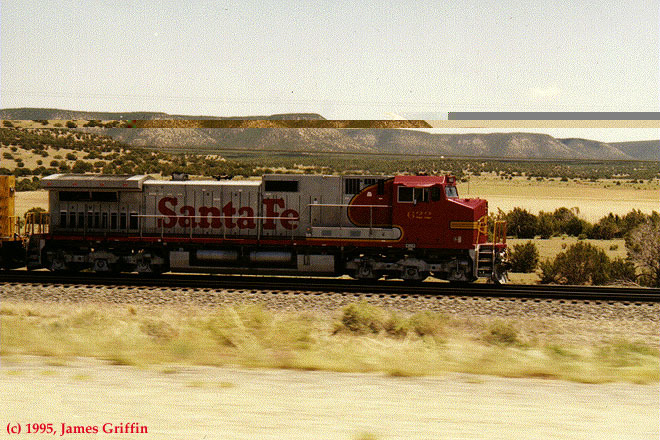 See the BNSF section for additional Warbonnet views, and stay tuned as I resurrect additional posts with Santa Fe alumni.